The weather this past weekend in Detroit was perfect. The temps were in the 70’s, there wasn’t a cloud in the sky, and I couldn’t think of better way to enjoy it than out on a bicycle aimlessly riding around. With no particular destination in mind I headed to the Dequindre Cut Greenway (a former railroad line) and rode its length from Gratiot Avenue, south to the Riverwalk. Once on the Riverwalk, I headed east along the Detroit River to where it ends at Mt. Elliot. From there I worked my way over to the Belle Isle Bridge and headed out to the island for a 5-mile loop around. It was a peaceful morning on the island with little traffic but plenty of other cyclists, runners and walkers. Although the trees and other foliage were still pretty green, I did see a smidgen of autumn colors pushing their way in. 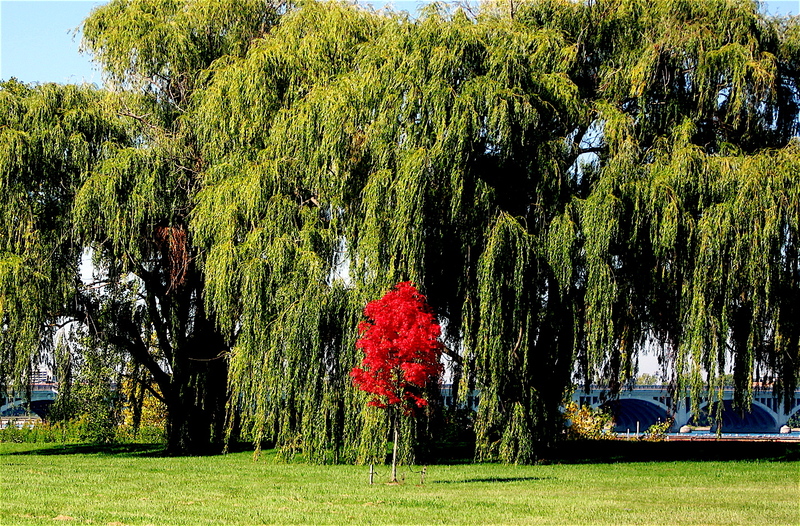 From Belle Isle I rode over the Detroit’s Historic West Village Neighborhood. That neighborhood and others that adjoin it along East Jefferson, is known as the Villages. The Villages were part of the weeklong Detroit Design Festival, and a good number of the design studios had open houses. 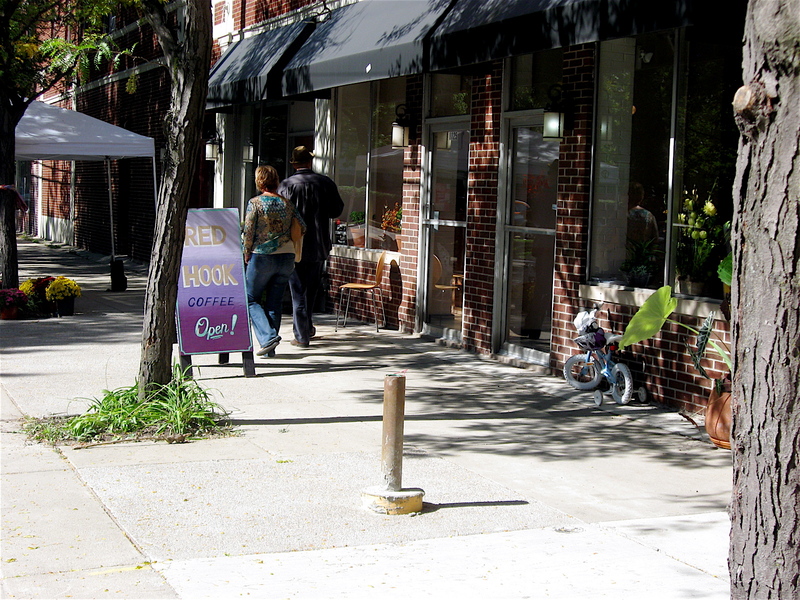 Along with that, many of the unique shops found in that neighborhood participated in an open-air marketplace. A new coffee-house called Red Hook opened its doors, joining a bunch of new restaurants found in West Village. Leaving there, I went downtown and headed north on Woodward Avenue where construction is under way for the new M1 light rail system. Dodging plenty of orange barrels, I came upon the new Red Wings Arena District that just broke ground a couple days prior. 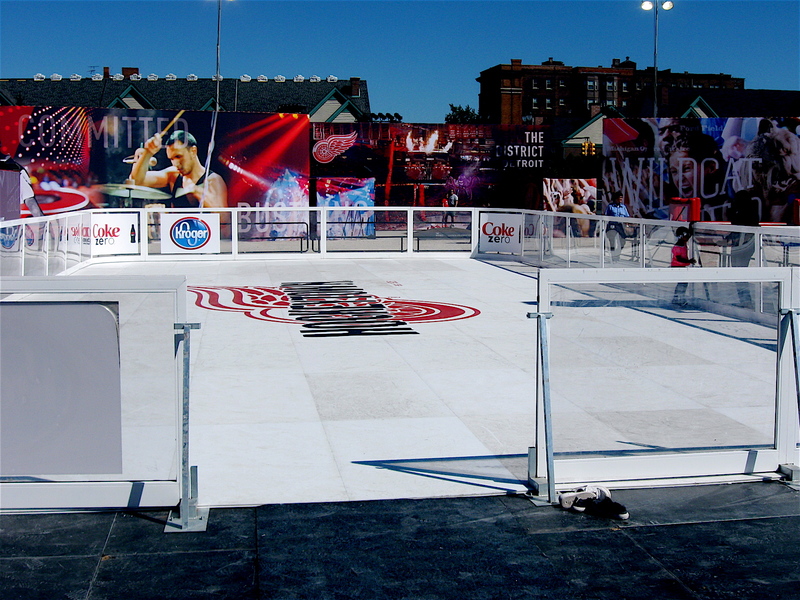 Although the construction zone was fenced off, they were allowing people to visit the site and skate on a synthetic ice rink that was ringed by large shipping containers. 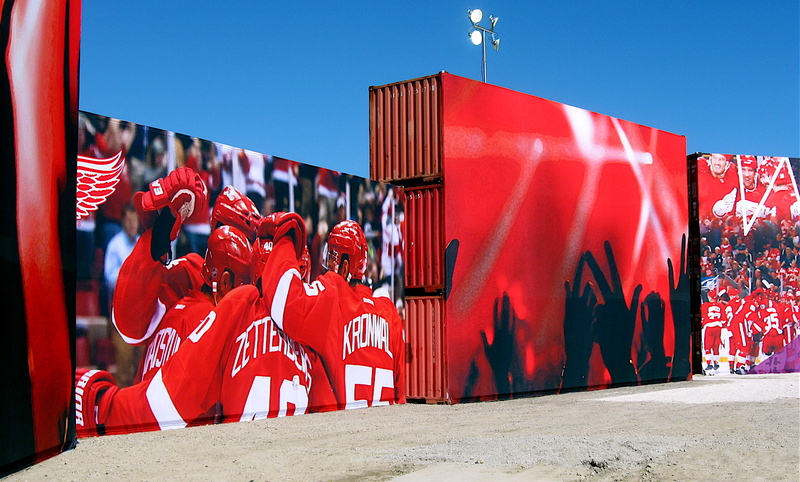 The containers featured large photos and images of the Detroit Red Wings. 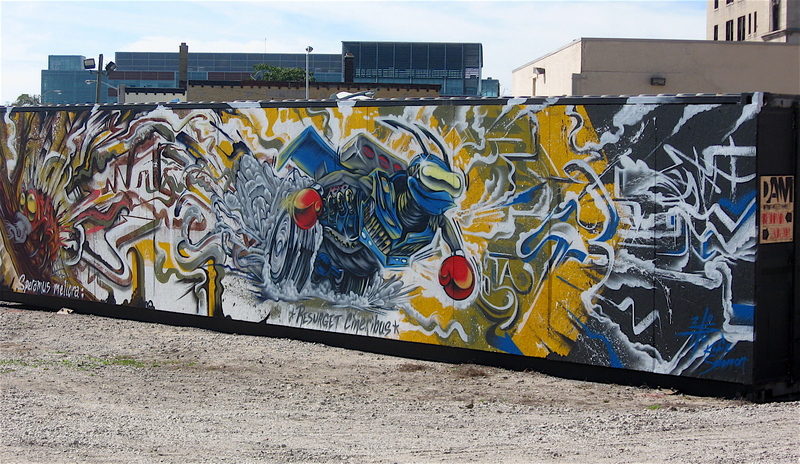 In addition to the Red Wings graphics, a few had colorful graffiti works painted by local street artists. Detroit’s nighttime festival of lights, called Dlectricity, lit up Midtown on both Friday and Saturday nights. 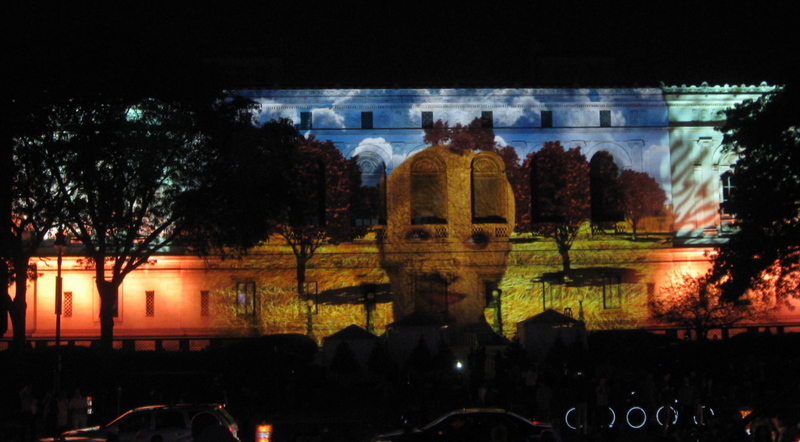 The light show featured over 30 world-renowned artists. Much of their work was featured on the exterior sides of buildings throughout the neighborhood, including the Detroit Institute of Arts, the Detroit Public Library, College For Creative Studies, the brick wall on a building at Warren and Woodward Avenues, the Garfield Building, and many others. As I soon found out, getting around the neighborhood (with mobs of cars and people) was a breeze on a bicycle. The Dlectricity event also featured a Light Bike Parade Saturday night, and over 2,000 riders participated. 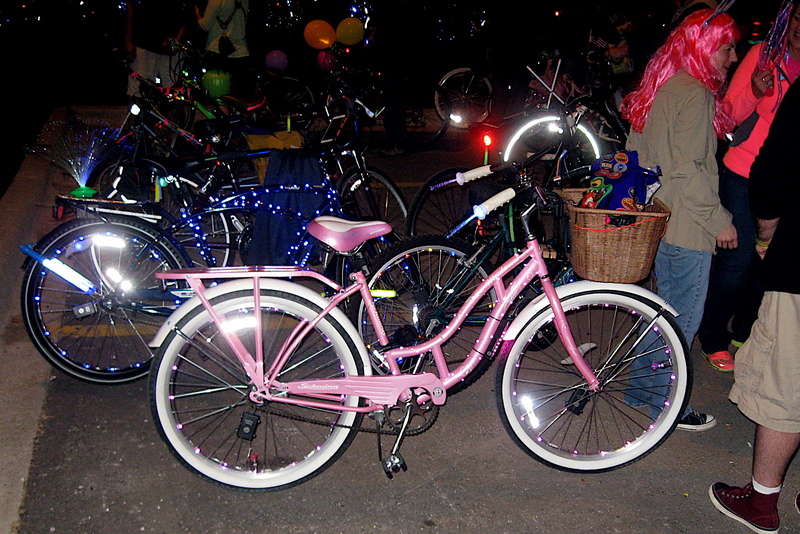 Most (if not all) of the bikes were decorated with flashing lights and other glowing devices. The night parade zigzagged its way along a 4-mile route throughout the Midtown neighborhood. The night ended with the Unofficial Dlectricity Afterparty at the Lincoln Street Artpark. That event kicked off at 11:00 p.m. and didn’t end until the sun came up. 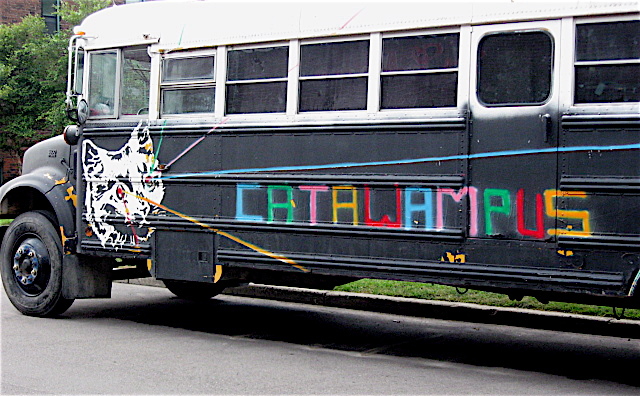 The party featured live bands, light shows, a huge bonfire, and Classic Sci-Fi movies shown in the Catawampus bus. 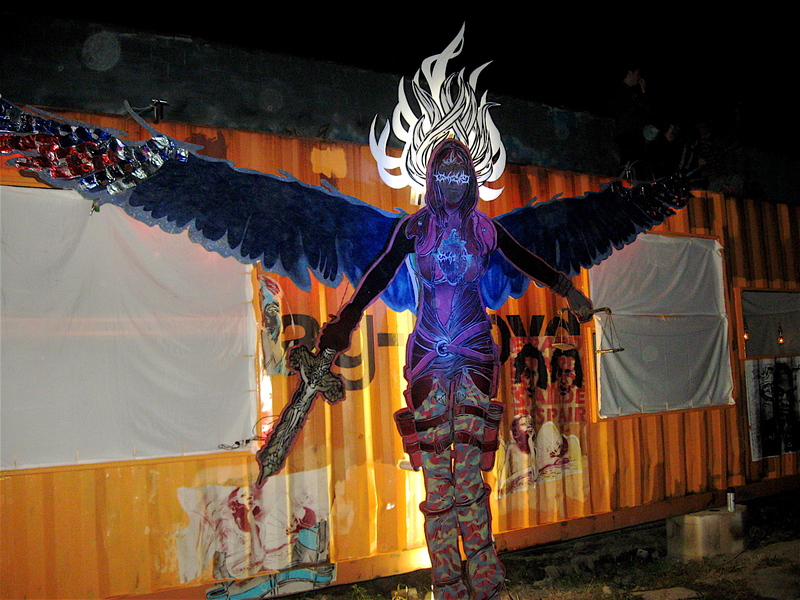 It’s always an interesting night at the Art Park and the afterparty was no exception. 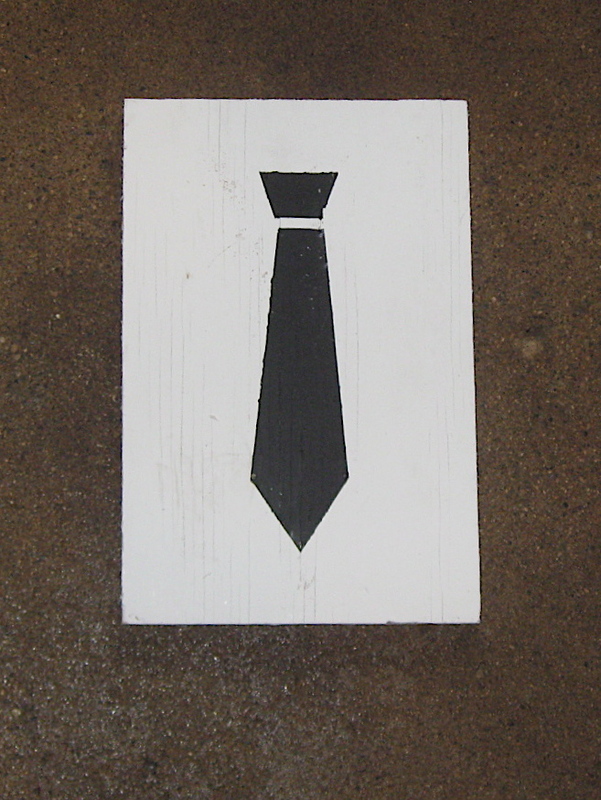 While bicycling around the streets of Detroit on this busy weekend, I also managed to pick up number 26 of 3,000 of the “Stay Classy” black tie art pieces that were scattered across the city. They seemed to be everywhere I went on Saturday and most were gone by late Sunday afternoon.